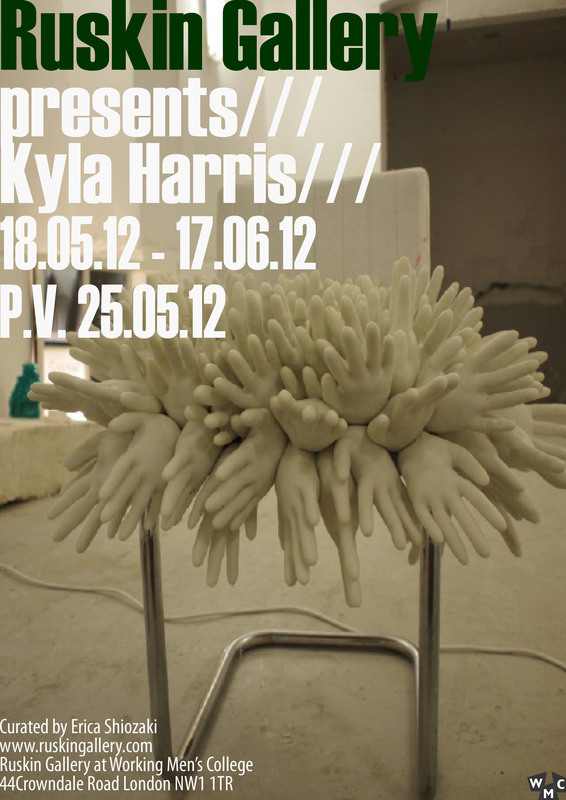 In accordance with Diversity Day at WMC, Ruskin Gallery is pleased to announce the solo exhibition of Canadian artist Kyla Harris. Largely influenced by her accident in her teenage years, much of her practice represents themes that directly relate to her experiences of disability. Instigated by her physical experience, the works here aim to discover and analyse physical and mental relationships a human body can have with diverse objects. As a society we are conditioned to respond and think in a certain way when interacting with any object, but Harris questions what would happen if this expectation were completely disrupted. Untitled (2012) has been covered with white surgical gloves, making it a dysfunctional chair. With its original purpose lost, it is no longer a chair and instead stands as a mere object with steel frame and numerous white ‘hands’ protruding from its body. An eerie and discomforting situation is created through the gloves, and as viewers we respond to this object in a new manner. Harris’ current practice also has an intrinsic connection to her experience with NHS appointments, and through her use of medical equipments in sculptures and installations, she explores the transient relationship human beings have with the supplies. The collected items within her artworks, which include oxygen masks, gloves, tubes and syringes, are all disposable, yet every element is fabricated and engineered with detail and precision. Instead of disposing them, Harris reconstructed them into other objects, such as a chandelier (Untitled, 2012) made out of recycled and new catheters. Through the process of collecting and assembling, Harris deconstructs the original meaning of the materials, to then add new definitions to their existence and propose a new way of interacting with them, both mentally and physically. Ruskin Gallery supports Diversity Day and through this exhibition of Kyla Harris, it hopes to expand the awareness on issues surrounding diversity and equality within education. Kyla Harris is a Canadian artist living and working in London. Her past exhibitions/projects include Road Block, a collaborative project in London (2012); Vericolour at New Galley in London (2012), Points of Connection at Kingsland Road Studios in London (2012); and No Working Title, a collaborative project between Chelsea College of Art and Design, Bath Spa University and Camden Arts Centre (2012).